Last year, CEG assisted its partners at ACC, ECAC and the Metro Atlantic Athletic Conference (MAAC) in securing $152,000 through the Regional Economic Development Council CFA process. On April 10, CEG launched our new veteran attraction and retention arm, called the Veteran Connect Center (VCC). Justin Constantine, an Iraq war veteran and leading veteran employment expert, gave the keynote address for the launch at the Desmond Hotel. According to Justin, the VCC is “the VCC is implementing is a model for what so many other communities across our country can do.” At the event, we also announced the VCC will be powered by JobPath software, the nation’s leading veteran employment platform for transitioning service members. We are making the VCC’s JobPath software available to Capital Region employers. JobPath will give them access to the résumés of 200,000 transitioning service members and their spouses worldwide and enable them to do reverse searchers for applicants based on their Military Occupation Specialty (MOS) code. Employers interested in using JobPath or recruiting veterans should contact CEG Director of Investor Relations and Talent Attraction Karen Wolff at karenw@ceg.org or 518-465-8975 X223. Continuing to work with the ports in Albany and Coeymans, local manufacturing and supply companies interested in offshore wind (OSW) production to engage OSW developers and companies looking to establish operations in the U.S. market. Participating with the New York State Research and Development Authority (NYSERDA) on OSW issues, including meetings with leading OSW developers looking for connections to New York State manufacturers and fabricators. Attending events to build awareness of regional supply chain and sites for clean tech power projects, including energy storage, solar and OSW. Participating in meetings with SUNY Polytechnic Institute and our upstate partners to explore the regional role for SEMI’s global workforce attraction/retention initiatives. Working with Applied Materials in the Capital Region and in California to further explore their timetable and plans for their new Materials Engineering Technology Accelerator (META) Center at SUNY Poly. Planning for the Upstate NY Venture Workshop in October at SUNY Poly. Partnering with local video game studios to host a “NYMakesGames” dessert reception at the 2019 Game Development Conference (GDC) in San Francisco. Working with New York State’s three video game hubs to enhance their presence at industry events. Working to develop programs dedicated to independent game studio development. In Q1, CEG continued its work in apprenticeships, most notably with the launch of Beechnut’s first apprenticeship program in over a decade. The first cohort will begin in Q2 with 13 electro-mechanical technician apprentices. We are also working closely with four other companies to launch their programs this year, one of which will be among New York State’s first software developer apprenticeship program. CEG also worked with HVCC to run the fourth Manufacturing Technology Bootcamp in January. The class had 18 graduates who sought to enter the entry-level manufacturing workforce upon completion. The next boot camp is slated to run in early June. The second Certified Production Technician cohort at Schenectady County Community College started in late March and will graduate in June. We are pleased to announce that Pisa BioPharm contracted with Talent Connect for New-Hire Navigation Services and the Wealth Advisors Group joined our Community Resources List for newcomers to the Capital Region. On Feb. 4, Talent Connect and the CEG’s new Veteran Connect Center attended Rensselaer Polytechnic Institute’s Employer Open House to meet the university’s employer relations team and learn about student recruitment. 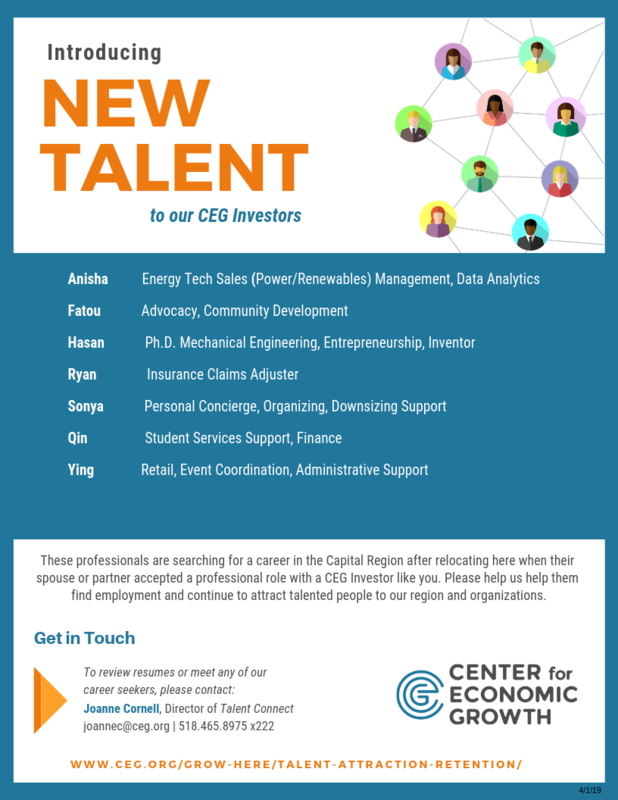 On Feb. 6 Talent Connect exhibited at RPI’s Student Career Fair with Alaant on behalf of CEG investors. We also revamped our Careers in New York’s Capital Region. 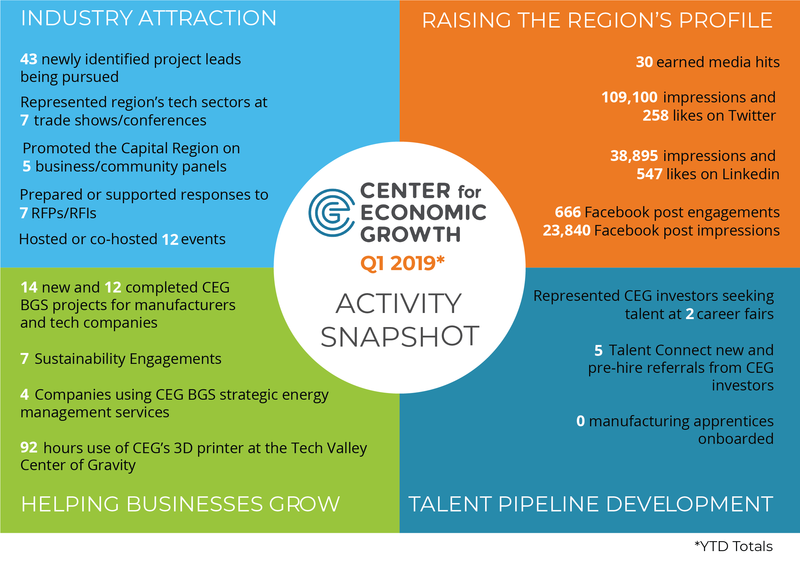 See our Introducing New Talent summary for information on the spouses of talent relocating to the Capital Region and searching for a career here. Q1 2019 update: A greater number declining trends in the Manufacturing Scorecard offset the increases in positive trends in the other scorecards. That resulted in a total 18 positive-trending indicators in Q1, compared to the same number in previous quarter. Download the Q1 2019 CEG Economic Scorecards.